OLDER PEDESTRIANS ARE most at risk of being killed in a road collision in Ireland, according to new research. The research conducted by the Road Safety Authority (RSA) established that, between 2008 and 2015, 42% of the 313 pedestrians killed on the roads were aged 56 and older, and 15% of those were aged 75 and over. When the pedestrian cases were broken down by age, the 75+ group had the highest number of fatalities. The research was presented at the RSA’s annual academic lecture on road safety, which also heard from Professor Tom Brijs from Hasselt University in Belgium. He explained that internationally many crashes occur at intersections and in many cases this is because infrastructure design features are not adapted to the people using them. Factors that contribute to collisions involving older pedestrians include falling or stumbling, additional time taken to cross a road at traffic lights, and the wearing of dark clothes in poor visibility conditions. He suggested that traffic calming measures, the introduction of pedestrian islands on roads and extending the time pedestrians have to cross the roads at lights could help improve Ireland’s statistics. The traffic signals manual used by most local councils sets the timing at 1.2 metres per second, but local authorities can use their discretion. Chairperson of the RSA Liz O’Donnell said is it important as we move into darker evenings that we look at measures to prevent and reduce pedestrian collisions, on rural roads in particular. So far this year 27 pedestrians have lost their lives on Irish roads. 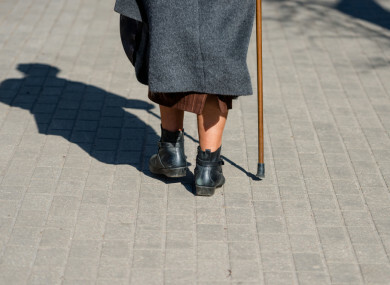 She said older people, in particular are vulnerable – pedestrian risk increases with age. “You rarely see an elderly person in high visibility clothing,” she said. She noted that older people are regularly walking in rural areas to go collect their pension or for socialising. She asked drivers to “look after vulnerable road users” by reducing their speed in darkness so they have less of a chance of an incident. If there is a collision, a pedestrian will have a greater chance of survival if the car that hit them was not travelling at high speed. According to today’s research, one third of pedestrians were crossing the road when they were struck, 21% failed to observe, 9% were lying on the road and 8% were standing in the road. The majority of people in the last two groups had consumed alcohol. An overwhelming majority of pedestrians involved in fatal incidents were not wearing high-visibility clothing and 49% had consumed alcohol. In 70% of cases, the pedestrian was deemed culpable. CEO of the Road Safety Authority Moyagh Murdock told the audience that today’s lecture and the discussion around it reminded her of the death of her grandmother 30 years ago. She was crossing the road after mass to go to her house, which was directly across the road from the chapel, when she was hit by a car. She suffered a broken leg and died after she developed pneumonia in hospital. Murdock questioned whether things would have been different if there had been a 30km/h zone outside the chapel, which would have given the driver more time to stop. She said the RSA was “unapologetic” in its work, referencing “nanny state” criticism she has heard in the past in relation to road safety campaigns and measures. The RSA’s job, she said, is to reduce the number of read deaths and they are coming down, but there is still work to do. Email “Traffic lights that take longer to change could reduce older pedestrian road deaths”. Feedback on “Traffic lights that take longer to change could reduce older pedestrian road deaths”.